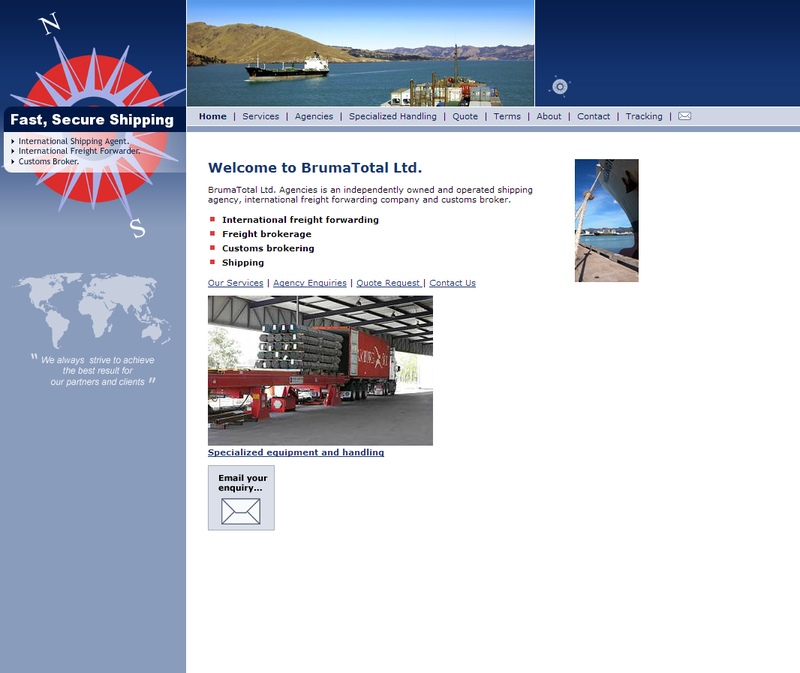 This fake shipping and escrow site is targeting car buyers in Australia. I have tried in vain to contact the news comapny in Australia about these scammers but they refuse to repond. The doe eyed supposed expert, Mr Darson?, in the video mentions the fake escrow as being a new way of scamming people. 4 BILLION DOLLARS were funneled into Romania using that service in 2009. Can you imagine how much money Western Union makes off scams? The page also contains a list of the previous sites run by these Romanian scammers that targeted Australian victims. This is a fake shipping and escrow company run by scammers in Romania. The scammers are listing fake ads for vehicles on the internet. 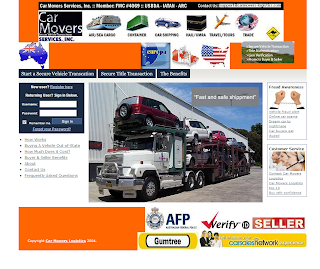 Car Movers Logistics is a fake escrow site targeting car shoppers in Australia. The scammers are posting ads on Gumtree. 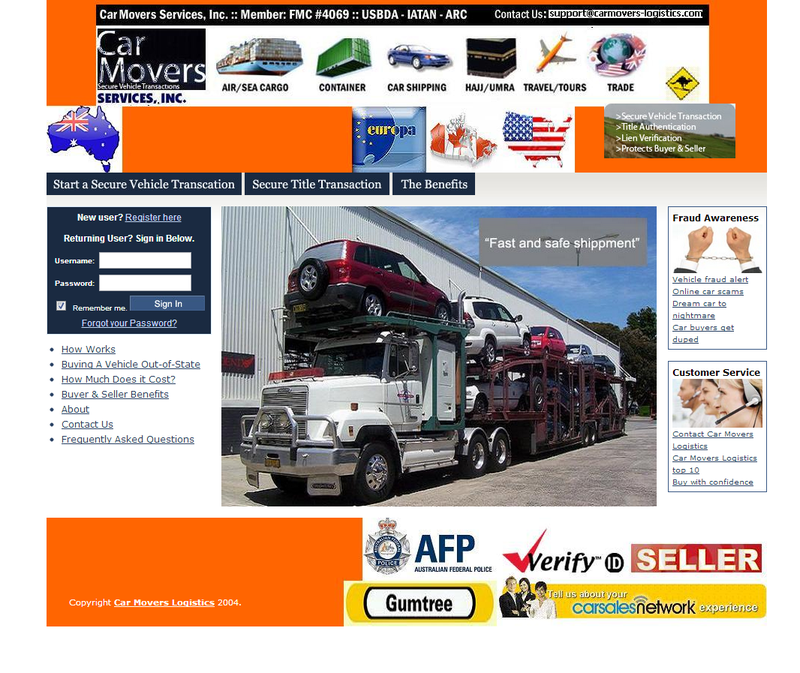 Car Movers Logistics is an independent escrow company based in NSW, ABN: 66 051 458 541. As a buyer, you are the beneficiary of our 5 - step process that postpones the release of your funds until a complete vehicle inspection, during the inspection period. You are also enjoying the advantages of using easily obtainable e-currencies, such as worldwide mobility and most of all, privacy. As a seller, you enjoy the flexibility of our cooperation with major ground-shipment providers, which translates into a reduction of the period of time in which your vehicle reaches your customer. You will also be highly protected against payment fraud, as all disadvantages resulting from credit card payment methods, such as fraudulent use by the prospective buyer, are eliminated. Internet fraud costs victims millions of dollars each year. Protect yourself with Car Movers Logistics We protect both the buyer and seller with a simple, 5-step trust process. Car Movers Logistics was created after our founder was personally a victim of Internet vehicle fraud (read his true story). We have created a service that would help eliminate vehicle scams on the Internet, protect your financial interest and allow people a safe and convenient way to purchase a car, truck or SUV online. Our team of professional Vehicle Transaction Specialists (VTS) have over ten years of combined experience in processing vehicle sales and title transfers. So go ahead and find the car of your dreams online but remember to use Car Movers Logistics to avoid any nightmares. Car Movers Logistics is hosted on secure servers using the latest in encryption technology. Alternative BS, the operator of this online system is a licensed and acredited escrow company that operates in compliance with currently applicable escrow regulations. All escrow services offered on this Website are provided independently and exclusively by Internet Escrow Services (SM) (IES), one of the operating subsidiaries of Car Movers Logistics IES is fully licensed and accredited as an escrow company and is subject to compliance with all applicable escrow regulations. Car Movers Logistics is the recommended transaction settlement service of many of the top names in eCommerce, including eBay.com.au, Carguide.com.au and Carsales.com.au. Both parties agree to terms of the transaction, which includes a description of the vehicle, sale price, number of days for the Buyer's inspection, and any shipping information. Either the Buyer or Seller signs in to Car Movers Logistics and creates a transaction. If either the Buyer or Seller is not a registered user, they must register with Car Movers Logistics . Registration is free. The initiating party confirms the information entered, and agrees to the escrow instructions. The other party is notified by e-mail, to sign in and agree to the terms of the transaction provided by the initiating party. After both parties have agreed to the terms, the Buyer will be asked to submit payment to Car Movers Logistics . The Buyer submits an available payment option. Car Movers Logistics verifies the payment. Processing time varies by payment method. When payment is received, it will be verified and secured into a non-interest bearing trust account. After payment is secured, the Seller is notified by Car Movers Logistics to ship the vehicle to the Buyer. Upon payment verification, the Seller is authorized to ship vehicle and submit tracking information if available. Car Movers Logistics verifies that the Buyer receives the shipment. The inspection period will not begin until Car Movers Logistics has confirmed delivery of the vehicle or the Buyer marks the vehicle as received on the transaction screen. The Buyer has a set number of days for an inspection and the option to accept or reject the vehicle. For more information, FAQs - Return Questions. When the Buyer accepts the vehicle or the inspection period expires (at which point, the Buyer automatically accepts), the disbursement of payment will begin. Please note that Car Movers Logistics may perform additional verification before funds are released. Payment is sent to the Seller with escrow fees and shipping costs deducted, if applicable.If the buyer rejects the car, he must notify Car Movers Logistics and then ship the car back to the seller. Once the seller has confirmed the car, Car Movers Logistics will refund the payment in full and the seller is responsible for the returned shipment. Car Movers Logistics Pays the Seller by the method selected by the Seller.